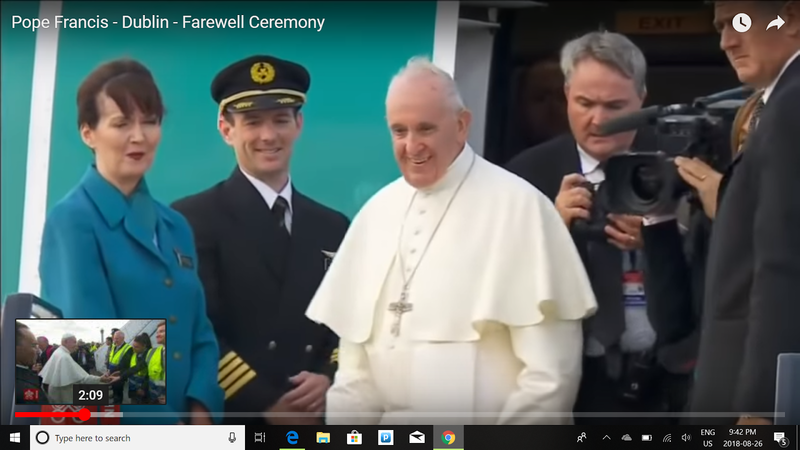 HIS EXCELLENCY MICHAEL D. HIGGINS PRESIDENT OF IRELAND DUBLIN AS I LEAVE IRELAND, I WISH TO EXPRESS MY GRATITUDE TO YOUR EXCELLENCY, THE GOVERNMENT AND THE BELOVED PEOPLE OF IRELAND FOR THE WARM WELCOME AND HOSPITALITY I HAVE RECEIVED. WITH THE ASSURANCE OF MY PRAYERS, I INVOKE UPON ALL OF YOU ALMIGHTY GOD’S BLESSINGS OF PEACE, FRATERNITY and PROSPERITY. FRANCISCUS PP.